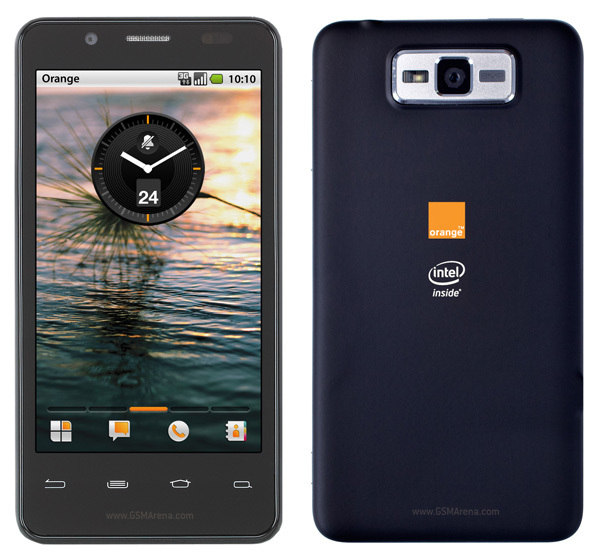 After Lenovo and Motorola, Intel has now collaborated with Orange to bring a Medfield-based smartphone to the market. The phone in question, codenamed Santa Clara, has been designed and developed by Intel and is the same reference unit or FFRD (Form Factor Reference Design) that Intel showed off back at CES when they announced Medfield. Unlike most other reference units, the Santa Clara has been designed not only to show off the platform's capabilities but can actually be used by the customer as a day-to-day handset. This means it has a fairly standard shape and size, which measures 123mm x 63mm x 9.99mm and weighs in at 117g. The Santa Clara has an Intel Atom Z2460 SoC, 1GB of RAM and 16GB of inbuilt storage. It will release with Android 2.3 Gingerbread, with an Ice Cream Sandwich update coming up, which we have already seen in action on the Lenovo K800 that was displayed at CES so it shouldn't take long. The partnership with Orange is unique because for the first time a chipset manufacturer is selling its FFRD directly to a carrier instead of going through an OEM. Although Intel already has deals in place with both Lenovo and Motorola, Medfield devices from them should take some more time, especially Motorola, whose Medfield lineup will not arrive before the year's end. By partnering with Orange, Intel is able to considerably speed up the process and get Medfield devices out there in the hands of the consumers as quickly as possible. Other details on Santa Clara are sketchy right now but we should be hearing more from either Intel or Orange soon. The buttons need to be lower.